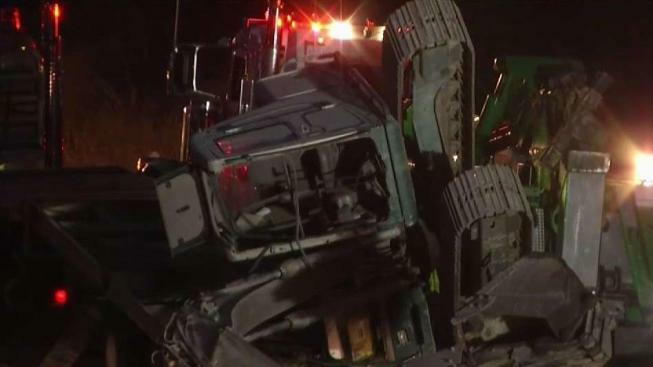 A big-rig hauling an excavator on Highway 17 in Los Gatos hit an overpass, prompting lane closures and a traffic nightmare during the Thursday evening commute. Ian Cull reports. The California Highway Patrol Friday morning is reporting all lanes of southbound state Highway 17 in Los Gatos have reopened following a crash Thursday involving a tractor-trailer hitting an overpass. A big-rig hauling an excavator on Highway 17 in Los Gatos hit an overpass, prompting lane closures and a traffic nightmare during the Thursday evening commute. The excavator fell off the big-rig's trailer and overturned after the truck hit the overpass at Blossom Hill Road, shutting down the overpass. "I went back around the other way and of course Highway 9 is jammed all the way back so I couldn't get there so I had to walk," said Jeff Crichton from Los Gatos. The CHP said the driver believed excavator's boom was completely lowered but it wasn't lowered enough. It hit the overpass, leaving the bar exposed and sending concrete falling onto just one car below. "We're very fortunate that no one got hurt in this incident as it could have been a lot worse," said CHP officer Jonas Bleisch. The accident led to partial closures on 17 and eventually an entire shut down so officials could flip the machine back on its wheels and tow it away. The traffic was backed up for miles causing commuters much delay. Enrique Navarro from Santa Rosa was driving to pick up a friend who's car broke down on the other side of the highway. "I just see the sign that said all four lanes blocked off, because of a huge accident," Navarro said. "So she's stuck over there, we're stuck over here and we're just trying to meet in the middle now." The CHP is investigating the incident, they don't think alcohol or drugs were a factor and it's not clear if the truck driver will be cited. View NBC Bay Area's traffic map for the latest conditions.